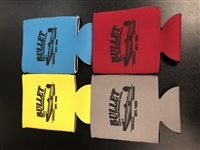 This Koozie brand can drink holder features the Bullet Logo and comes in 4 colors. 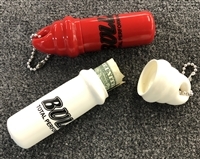 This is the replacement cup holder insert for the holes located to the outsides of the driver and passenger seats in your "X" Series Bullet Boat. This tournament towel is perfect for wiping fish slime off of your hands and equipment. Gray Towel with Black Logo. Comes with carabiner to hang for quick access. 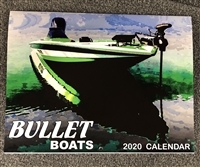 2019 Bullet Boats Calendar "12 Months of Bullets"
This calendar features 12 months of nothing but Bullet boats for the entire 2019 year! This is the replacement cup holder for all of our "S" Series boats. This cup holder will fit the 21SS, 21XRS, 21SDC, and 21SST boats. 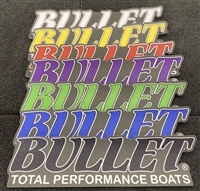 Bullet Boats Small Carpet Graphic Decal 20"x5.5"
This small carpet decal is ideal for the top of your center step area. It measures 20"x5.5" and is available with White or Red Letters. Material is heavy duty non skid with adhesive backing made just for carpet applications. This is for one small decal only. Be sure to check out our larger carpet decal available for rod locker lids. This handy tool holder attaches to the side of your console with 3m tape and is made to hold pliers, scissors, and lures to be easily accessible. 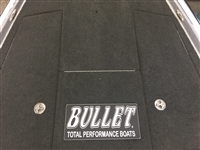 Bullet Boats Large Carpet Graphic Decal 32"x7"
This large carpet decal is ideal for the top of your port and starboard side rod locker lids. It measures 32"x7" and is available with White or Red Letters. Material is heavy duty non skid with adhesive backing made just for carpet applications. This is for one large decal only. Be sure to check out our smaller carpet decal available for center step area. This precision made CNC Cull Beam is Laser Etched with the Bullet logo and will insured that you don't throw back the wrong fish on tournament day. 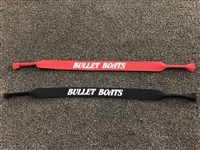 This stylish "BULLET" engraved aluminum fish ruler is a must have for the tournament angler. It provides precise measurements for all fish up to 18". 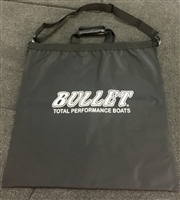 Considered the best Weigh-in Bag on the market, this Bass Mafia Body Bag has been custom printed with the Bullet Logo. Features a zippered opening, shoulder strap, dual carry handles with velcro closure and double welded seams. This vinyl banner is 2'x5' and features our classic Bullet logo. Available in several color options. Choose colors below. This decal is 18" x 8" and can be placed on any carpeted area of your boat. They are an anti-slip surface and completely removable. This is the replacement divider located in the center of your Bullet livewell. We recommend that you silicone this piece in place after you snap it into the grove in the middle of your livewell, to prevent it from popping out when running over wakes. Please select your boat from the choices below. 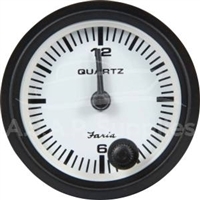 This Clock Gauge is a must have for the avid tournament angler. It fits in any of the smaller size gauge holes on your Bullet dash gauge cluster. Available in black bezel only with very light gray face. This useful tool is designed to be mounted in front of the driver's side console to hold tools and our Bullet measuring ruler. Perfect for holding your pliers, scissors, and fish ruler. Please note that this accesseory requires you to cut a hole into the drivers side rod locker and may allow some water to get into that locker after mounting. See pictures for a general idea of functionality. Bullet ruler is included. This is the 3 piece Tournament Combo, you'll get the Bullet Ruler, the Bullet Tournament Towel, and the Bullet Weigh-in bag from Bass Mafia. This heavy duty stainless steel pop-up boat cleat is the perfect addition for those of you that want to option to dock your boat solo without the fear of broken rods or or stubbed toes. You will have to drill a small hole in the top of your boats gunnel to install these cleats.